The debt that Fred M’membe and his partner Mutembo Nchito owe various government departments and commercial banks through their defunct Zambians airways has continued to swell. A statement obtained by the Watchdog from one of the Commercial banks shows that Zambian Airways now owes that particular bank more than two million USA Dollars. The debt is not being serviced but remains owing as the money they got belong to ordinary people’s deposits. Interest on the loan continues to accrue at average amount of $28,000 monthly. Because no repayments are made and only interest accrues and reflects on the bank statement at the end of each month. The outstanding debt as at 31st March 2014 was US$2, 218,123.07. Between 1st April and 30th April, interest will continue to accrue in the background and hit the account on the last day of the month. Compound interest continues to hit at 16% default rate. This is just the amount they owe one this one bank. They owe separate huge amounts to Development Bank of Zambia (DBZ), ZRA, National Airports Corporation, National Pensions Authority (NAPSA) and other banks that do not wish to go public. The debt owed to Development Bank of Zambia is said to have risen from K14 billion to K42 billion (14 million rebased) inclusive of capital. Efforts to recover this money have so far failed as M’membe and the Nchito brothers have refused to take responsibility for the loans. And now they have the full backing of the PF government. M’membe and the Nchitos argue that they cannot be personally held liable for the debts because the Zambian Airways was a separate legal person in law and therefore responsible for its own debts. But this is just crookedness and daylight criminality. The argument of separate legal personality or Salomon Principle (which essentially says that a company once incorporated is a separate and distinct legal entity from the people who set it up) cannot be applicable in this case. Even if the law makes a company a legal person, the company does not become a human being. It still depends on the human beings who set it up to operate. So, when these human beings commit crimes in the name of the company, they cannot hide behind the veil and say it was the company that committed the crimes. For, example, the loans that that Zambia Airways owe tax payers and individual bank clients were negotiated and signed for by Human Beings on behalf of the company. And that is where crimes were committed. The directors of Zambia Airways knew or ought to have known that the company was not doing well and there was no way of avoiding liquidation. But they continued trading and acquiring loans. This is called fraudulent l trading ie, directors knowingly, and with malice, carried on business affairs with no intent to pay their debts through the medium of the company. It is a criminal offence. There was also wrongful trading by Zambian Airways directors. This is simply where a company continues to carry on their daily business trading insolvent, that is, unable to pay their debts as they fall due. They hoped, in their usual stubbornness, that things would improve even though they could see that they were making losses on each flight. Each flight to Johannesburg was filled with free riding Post Reporters going to shop. 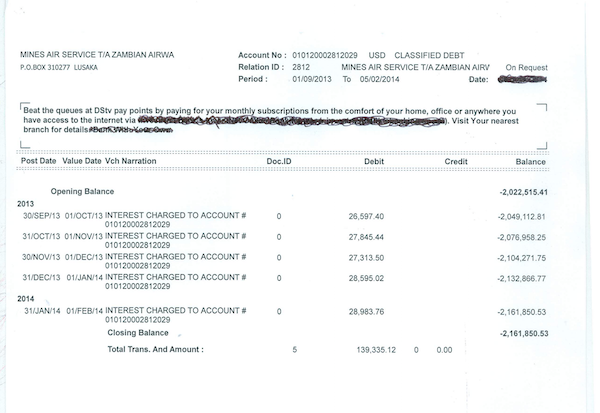 The carrying on of business despite knowledge that the Zambian Airways was broke was meant to defraud creditors. Knowing that a company is broke is very easy, just look at the accounts. In such a case, the distinction between the legal person and human being, the mask, should be pierced so that the true creditor or criminal should be made accountable. But who can do this when one of the criminals is the Director of Public Prosecutions?